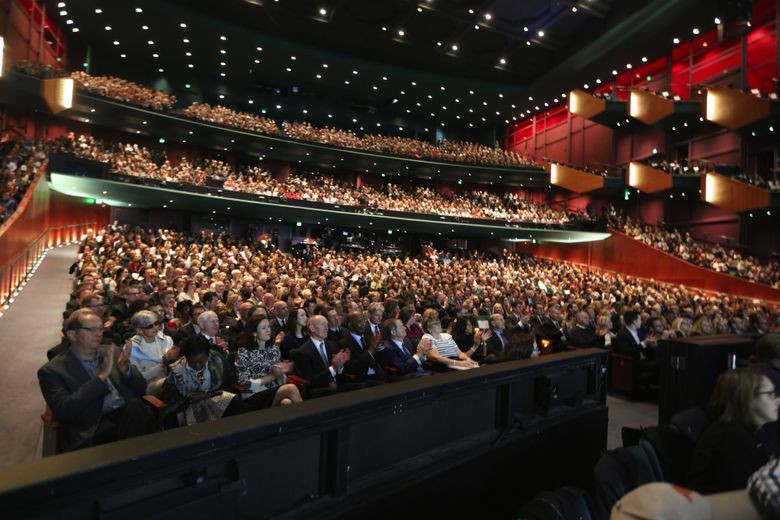 Shareholders hear about civic responsibility, corporate performance and the controversy over Starbucks’ fluctuating scheduling of employee hours with little advance notices. That turned out to be a hoax — but one with a serious message for Starbucks. 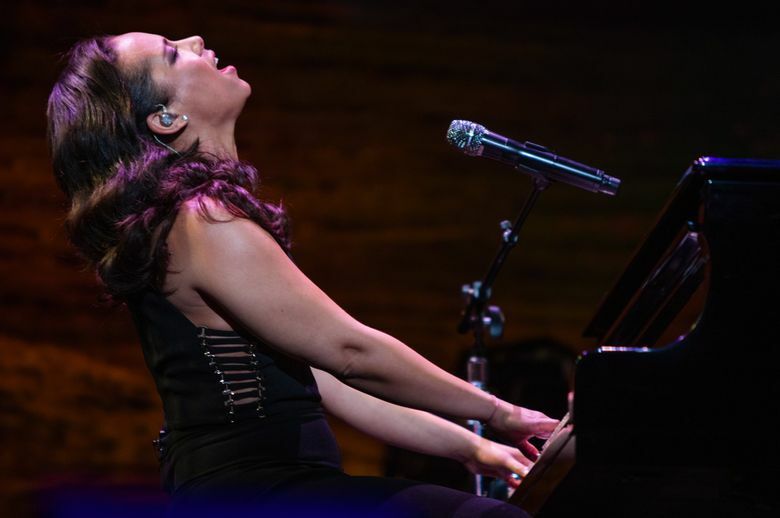 The meeting came off as planned, with the company announcing new business initiatives, CEO Howard Schultz talking about his vision for a more civil America, and Grammy Award winner Alicia Keys performing as the surprise musical guest. “Scheduling is a serious issue. But sometimes it’s good to have a little fun in exposing the issue too,” Sage Wilson, Working Washington’s spokesperson, said of the hoax, which initially fooled a few media organizations and investment websites. The intent wasn’t to trick people but to have them think about what it feels like to have their schedules changed by Starbucks at the last minute, he said. Starbucks has been one of the companies at the center of the worker-scheduling issue. Employees have complained they are scheduled for fluctuating hours, called in for unpredictable hours with little advance notice, and assigned to “clopening” shifts — those that call for working until late closing hours and then turning right around to work early opening hours. The company has said that in the last 18 months, it’s made improvements, including posting schedules at least 14 days in advance and requiring at least eight hours between any shift. Still, a report last fall from one nonprofit said the company was falling short of some of its promises on those issues. Working Washington says changes have been uneven, with some stores improving greatly while others still have people working “clopening” shifts. The company’s annual meeting presented an opportunity to press the issue, with a few baristas organized by Working Washington handing out coffee-cup sleeves with the hashtag #OurTimeCounts printed on them. And during the question-and-answer portion of the annual meeting, a barista, identified by Wilson as Darrion Sjoquist, asked Schultz if improving employee scheduling was something the company is considering. Schultz replied: “Not only is it something we’re considering but I think it’s at the top of our list” to try to create some balance between a more livable schedule for employees and the company’s ability to schedule thousands of people. 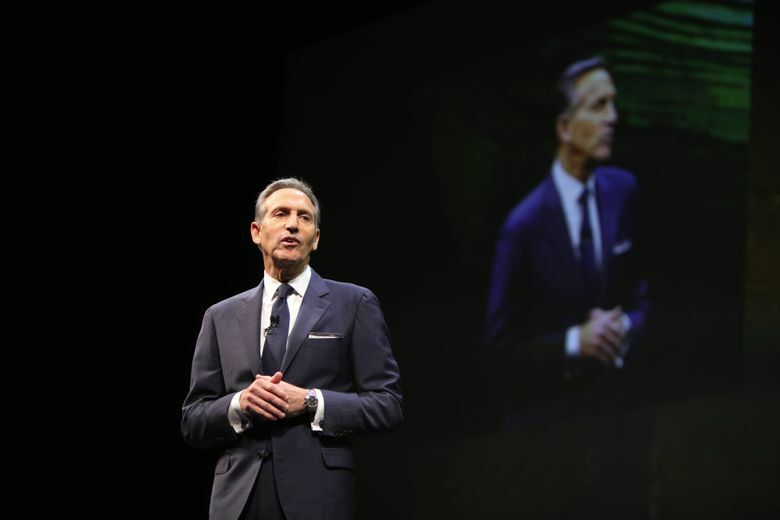 He said Starbucks needs a technological tool to be able to balance the needs of thousands of workers, some of whom want part-time jobs and some who need full-time hours. Sjoquist, the barista, could not be reached for his reaction. As per usual at the annual meetings, Schultz also offered some lofty thoughts on civic responsibility. America’s “reservoir is running dry,” he said, depleted by cynicism, fear, indifference and exclusion. This time, he said, he’s asking: “What is the role and responsibility of all of us as citizens,” calling on Americans to do everything they can to “fill the reservoir” with optimism, compassion and love. 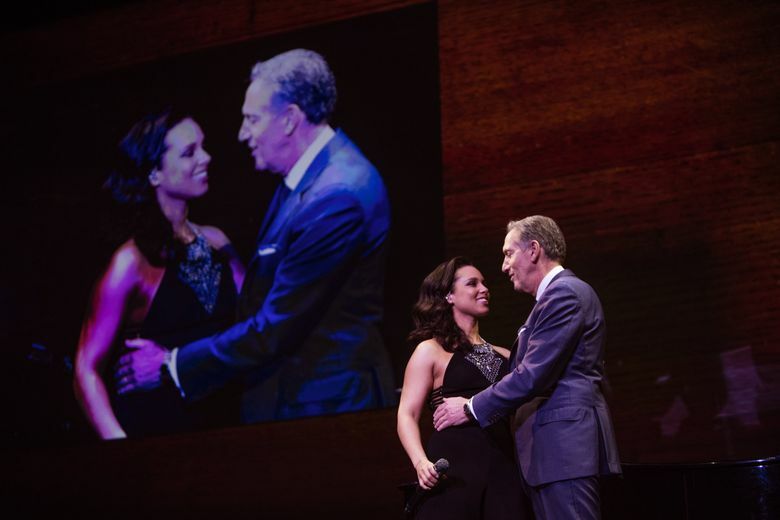 Other company executives offered more down-to-earth remarks about Starbucks’ business. Kevin Johnson, president and chief operating officer, recapped the company’s 2015 performance, which saw record revenues of $19.2 billion and record profits with earnings per share of $1.58. 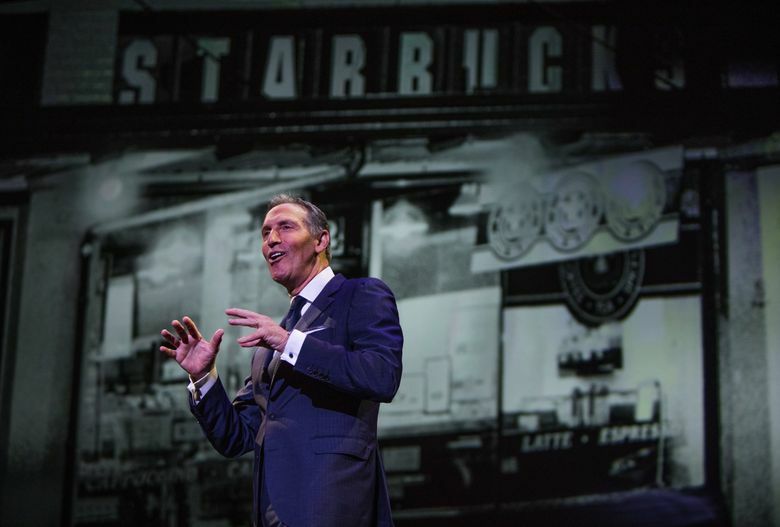 The company also announced a number of new initiatives at the annual meeting, including a new Starbucks Rewards prepaid card from Chase — another step in the coffee empire’s ambitions to build a web of partnerships to attract and retain Starbucks customers. Customers will earn Starbucks Rewards stars for using the reloadable prepaid Visa card for purchases. The partnership with Chase joins earlier ones announced between Starbucks and Spotify, The New York Times and Lyft, all designed to increase the appeal and reach of Starbucks’ mobile app and rewards system. Those partnerships offer Starbucks’ rewards-program members benefits with the partner companies and give customers of those companies opportunities to earn Starbucks stars, which allow them to get free items from Starbucks’ menu when they accumulate enough stars. Companies pay Starbucks to be allowed to offer the stars. Customers typically double their spending after signing up for the rewards program, Johnson said in an interview Tuesday. “It strengthens the relationship between Starbucks and Rewards members,” he said. Many Rewards members were incensed by a change in how Starbucks plans to award stars — a change that makes it harder for those who spend less at the store to earn rewards. That change, announced last month and taking effect April 12, replaces a system that rewards customers based on frequency of visits with one based on dollars spent. Many on social media expressed extreme displeasure with the change. More than 500,000 customers joined the rewards program over the last month, for a total 12.1 million members, up 1 million over the past quarter, the company said. Also starting April 12, customers will be able to redeem their Starbucks rewards through the company’s mobile order & pay system. • An updated agreement to supply the coffee for Starbucks K-Cups manufactured by Keurig Green Mountain. • The launch this summer of a new K-Cup line, Starbucks Latte, which will include caramel, mocha and vanilla latte flavors. • The launch in Europe this summer of espresso capsules compatible with Nespresso machines. • The launch of Starbucks Ready to Drink Cold Brew Coffee in the U.S. through a partnership with PepsiCo. • The release of a Windows Phone app within the next 45 days or so. • The extension of the Teavana brand into Starbucks retail stores across the Europe, Middle East and Africa markets, as well as the China and Asia Pacific markets. Starbucks shareholders voted on two proposals, approving one. The proposal that passed allows qualified shareholders to nominate up to two directors to the board, or up to one quarter of the directors, whichever is greater, and allows shareholders to vote on those nominees. Currently, only members of the board of directors can nominate directors. The proposal that didn’t pass would have had the company review its human-rights policies. Submitted by the National Center for Public Policy Research, a conservative research foundation, the proposal was intended to prevent potential workplace discrimination against employees for engaging in political activities outside of work hours, the center said.